There is legal online poker in the United States! The catch is that it can only played at Tribal Casinos located in 30 states across the US. In the landmark deal –which will surely help the full legalization of online poker—the Atlantis Internet Group (ATIG) has entered into an agreement with Cake Gaming to supply online poker to their patrons. Although Cake Poker will be providing the software, the two entities will remain independent of one another, so the player pools will not be combined. 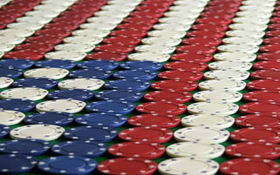 The agreement has created the first official online poker network in the United States. The Casino Gateway Network (CGN) will provide the games over a Wide Area Progressive network (most commonly known by the acronym WAP) that will allow patrons of the Tribal casinos to play online poker against one another. Since, the gaming will take place only on Tribal land this exempts them from the restrictive government laws regarding online gaming. This entry was posted on Friday, September 10th, 2010 at 2:42 pm and is filed under Poker News. You can follow any responses to this entry through the RSS 2.0 feed. You can leave a response, or trackback from your own site.